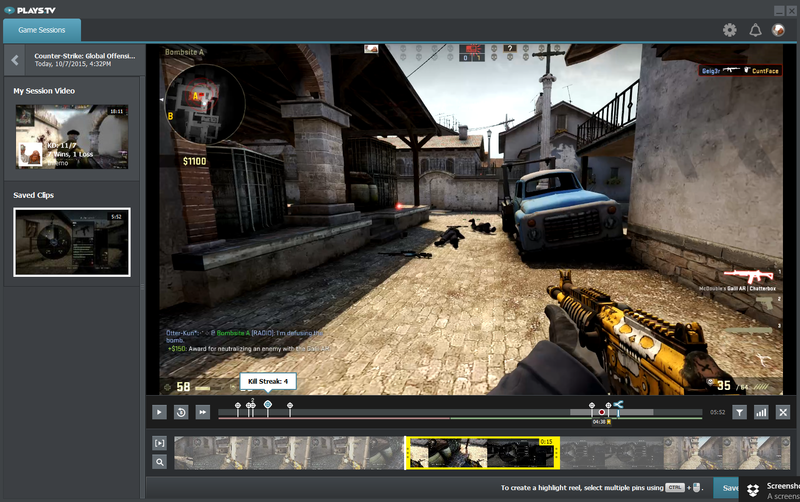 Plays.tv's video client now automatically IDs and highlights your most epic moments in Counter-Strike: Global Offensive. Raptr’s Plays.tv service, an addicting video-centric Instagram for gamers , is all about giving you the tools to easily record and share your epic gaming wins, then getting the hell out of the way. The service’s powerful, yet user-friendly video capture client makes it simple to quickly edit your gameplay clips and share them to the Plays.tv website; a September update enabled the client to automatically identify and flag your key League of Legends moments, then stitch them together into an exciting highlight reel in mere moments. On Wednesday, Plays.tv's “Highlight” and “Stitch” functionality is being extended to Counter-Strike: Global Offensive, a.k.a. the most popular competitive multiplayer shooter in the world. Why this matters: While most game-streaming services and recording tools—Twitch, YouTube Gaming, Nvidia’s Shadowplay, OBS, etc.—focus on capturing longer, more complete gameplay sessions, Play.tv ruthlessly focuses on faster, more immediately interesting clips. That makes the service inherently more “snackable” than its competitors, and that focus is just as clear in the Plays.tv video capture client. If finding and sharing your game highlights doesn’t involve hunting down specific moments in an hour-long match, then editing them together with expensive video-editing software, you’re much more likely to spread them far and wide. Enter Counter-Strike: Global Offensive’s new Highlights and Stitch support. The updated Plays.tv client will scour the live game data to automatically identify and flag your CS:GO kills, deaths, multi-kills, killstreaks, bomb plants, bomb defuses, hostage rescues, and more. In other words, every key Counter-Strike: GO event you’d care about. Beyond that, your CS:GO video clips will automatically be tagged with match info, and you’ll be able to link your Steam friends to your Plays.tv account to see when they post a clip of their own. The pins on the timeline under the game images in these screenshots show automatically ID'd game Highlights. “We know down to the second when you start doing damage to somebody,” Dennis Fong, the CEO of Raptr, said in a phone interview when the Highlights and Stitch feature launched for League of Legends. Raptr plans to add Plays.tv’s Highlights and Stitch functionality to Dota 2 in the coming weeks as well, at which point the service would automatically flag highlights in the top three competitive multiplayer games in the world. You can use a hotkey to manually flag Highlights in non-supported games, then Stitch them together the same way you would with LoL or CS:GO. Today’s software update adds some bells and whistles for all Plays.tv users, as well. You’ll be able to optionally show the mouse cursor and its movements in your recordings and add bookmarks to a clip at any point post-game. The clip timeline’s also been revamped, both aesthetically and functionally—you’ll find fast forward and rewind features now. That mouse cursor addition could prove interesting to padawans looking to learn from e-sports Jedis. Plays.tv has been aggressive in pursuing partnerships in the burgeoning realm of e-sports, recently inking agreements to have its software installed on competitors’ PCs during the Intel Extreme Masters event as well as Wargaming’s e-sports matches (a.k.a. World of Tanks, World of Warships, etc.). That integration gives Plays.tv users a player’s-eye view of the action at some of the biggest e-sports events in the world, rather than the usual omnipotent spectator’s view. Nifty!